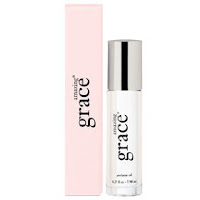 philosophy's best-selling amazing grace perfume oil in two convenient roll-on applicators. Any amazing grace devotee who loves the strength of a perfume oil and control of a roll-on applicator. It's for the woman who never wants to be without her favorite fragrance, or any woman looking for an ultra-clean, feminine scent.